Maybe you're ready to make an offer on that dream home down the street. Maybe you're eying a new car for that long commute to work. Or, maybe you just want to plunk down a few thousand dollars on a fancy vacation or the latest gadget. 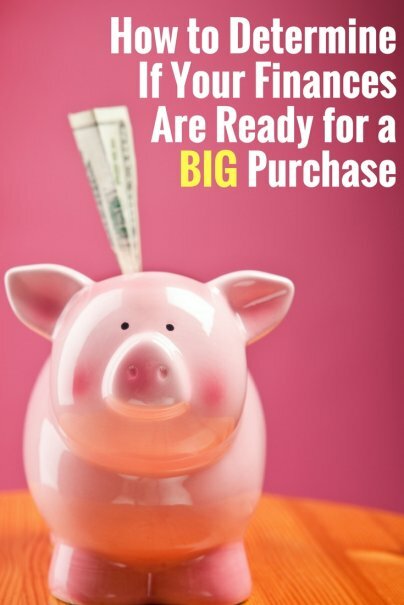 How do you know that you're financially ready to make such a large purchase? Whatever it is that you want to buy won't bring you any joy if you can't actually afford it. Here are some questions you need to ask yourself to make sure you're financially ready to commit to a big purchase. Do you already pay all your bills on time? If you're taking out a loan for a large purchase such as a house or car, first look at how you pay the rest of your bills. Do you routinely pay your credit card bill three weeks late? How about your utilities or cellphone bill? If that's the case, you're not ready for the financial responsibility of another large monthly payment. If you're already struggling to pay your bills on time, adding another even larger bill to your financial responsibilities will only put you at a higher risk of accumulating debt. You can hurt your credit score doing this, too. If you're late on the monthly payments for a house or car by 30 days or more, your score will tumble — usually by 100 points or more. If you struggle enough to pay those big payments on time, you might even lose the house or car altogether. How much wiggle room is left in your budget? Before making any big purchase, it's important to check your household budget. Make sure you have the ability to make the monthly payments comfortably while leaving enough money to cover your other monthly expenses. How strong is your credit? Before taking out a loan for a new car, home, or other big purchase, make sure to check your credit. Lenders rely on your credit score to determine if you qualify for loans and, if you do, how high of an interest rate they'll charge. Lenders consider credit scores of 740 or higher to be strong ones. Generally, the lower your credit score, the higher your interest rate on loans. The higher the interest rate, the more paying off that big purchase will cost you over time. You can check your credit reports — a list of your outstanding loans, how much you owe on credit cards, and whether you have any late payments or other financial blemishes in your past — by visiting AnnualCreditReport.com. At this site, you can order one free copy of each of your three credit reports (from Experian, Equifax, and TransUnion) every year. It's important to make sure that there are no errors on your credit reports and that the bureaus don't have any late payments or other financial black marks listed against you. These reports, though, don't contain your credit score. You can order your score for a small fee from any of the bureaus. Credit card debt is among the worst kind of debt to have. Interest rates can be as high as 16 percent, 18 percent, or even higher. If you carry a balance on your cards each month, your credit card debt grows quickly. Can you cover the maintenance expenses? If you can't afford to maintain your big purchase, hold off until you can create more wiggle room in your budget.